Life coach Ryan David authored this book out of a passionate desire to end suffering by helping people prosper, have a brighter future and sleep well at night. At The Movement Academy, you’ll be surrounded with an interactive community dedicated to improving their lives. Don't wait! A better life is possible, right now... get the book! © 2019 The Movment Academy, All rights reserved. 1. Collection of Information. 1.1 Survey Information. The Movement Academy collects information from individuals by various methods, including, but not limited to, when an individual voluntarily completes an The Movement Academy survey, order form, or a registration page either online or offline, or by means of online or offline surveys, order forms, or registration pages operated by third parties (collectively, a “Survey”). (As used herein, “online” means using the Internet, including the Website, and related technologies, and “offline” means by methods other than online, including in person, in the postal mail, using telephones and cell phones, and other similar means.) In the Surveys, The Movement Academy or a third party (a “Third Party”) may ask an individual to provide various information to The Movement Academy, which may include his or her name, email address, street address, zip code, telephone numbers (including cell phone numbers and carriers), birth date, gender, salary range, education and marital status, occupation, social security number, employment information, personal and online interests, and such other information as may be requested from time to time (together, “Survey Information”). The Movement Academy may also collect information concerning an individual from another source and use that information in combination with information provided from this Web Site. Completing the Surveys is completely voluntary, and individuals are under no obligation to provide Survey Information to The Movement Academy or Third Party, but an individual may receive incentives from The Movement Academy or a Third Party in exchange for providing Survey Information to The Movement Academy. 1.2 Third Party List Information. The Movement Academy collects information from individuals when an individual provides information to a Third Party and The Movement Academy subsequently purchases, licenses, or otherwise acquires the information from the Third Party (the “Seller”). Such purchased information may include, but is not limited to, an individuals name, email address, street address, zip code, telephone numbers, birth date, gender, salary range, education and marital status, occupation, industry of employment, personal and online interests, and such other information as the individual may have provided to the Seller (together, “Third Party List Information”). When acquiring Third Party List Information, The Movement Academy seeks assurances from the Seller that the Seller has a right to transfer the Third Party List Information to The Movement Academy and that the Seller has a right to provide offers from advertisers to the individuals whose personal information is included on the Seller's list. 1.3 Other Information. Other occasions when The Movement Academy obtains information from individuals include (1) when an individual is making a claim for a prize or seeking to redeem an incentive offered by The Movement Academy or by a Third Party, (2) when an individual requests assistance through The Movement Academy’s customer service department, and (3) when an individual voluntarily subscribes to a The Movement Academy service or newsletter (together, “Other Information”). 1.4 Cookies, Web Beacons, and Other Info Collected Using Technology. The Movement Academy currently uses cookie and web beacon technology to associate certain Internet-related information about an individual with information about the individual in our database. Additionally, The Movement Academy use other new and evolving sources of information in the future (together, “Technology Information”). (a) Cookies. A cookie is a small amount of data stored on the hard drive of the individuals computer that allows The Movement Academy to identify the individual with his or her corresponding data that resides in The Movement Academy’s database. Individuals who use the Website need to accept cookies in order to use all of the features and functionality of the Website. (c) New Technology. The use of technology on the Internet, including cookies and web beacons, is rapidly evolving, as is The Movement Academy’s use of new and evolving technology. As a result, The Movement Academy strongly encourages individuals to revisit this policy for any updates regarding its use of technology. 1.5 Outside Information. The Movement Academy may receive information about individuals from Third Parties or from other sources of information outside of The Movement Academy including information located in public databases (“Outside Information”). 1.6 Individual Information. As used herein, Individual Information means Survey Information, Third Party List Information, Other Information, Technology Information, and Outside Information, and any other information The Movement Academy gathers or receives about individuals such as usage data, file transfer and viewing data. 1.7 No Information Collected from Children. The Movement Academy will never knowingly collect any personal information about children under the age of 13. If The Movement Academy obtains actual knowledge that it has collected personal information about a child under the age of 13, that information will be immediately deleted from our database. Because it does not collect such information, The Movement Academy has no such information to use or to disclose to Third Parties. The Movement Academy has designed this policy in order to comply with the Children's Online Privacy Protection Act (“COPPA”). 1.8 Credit Card Information. The Movement Academy may in certain cases collect credit card numbers and related information, such as the expiration date of the card (“Credit Card Information”) when an individual places an order from The Movement Academy. When the Credit Card Information is submitted to The Movement Academy, such information is encrypted and is protected with SSL encryption software. The Movement Academy will use the Credit Card Information for purposes of processing and completing the purchase transaction, and the Credit Card Information will be disclosed to Third Parties only as necessary to complete the purchase transaction. Log File Data: When users log-in to access their account, our servers will automatically record and archive certain information that web-browsers send whenever visiting a Website. These server logs may include information vital to validating the user’s authorization to access the account. Information, such as a Web request, Internet Protocol (the “IP”) address, browser type, browser language, referring pages, exit pages and visited URLs, platform type, click counts, pages viewed and in what order, time spent, the date and time of the request, and other important data is necessary to validate and authorize a user’s entry and activity on the Website. 2. Use of Individual Information. 2.1 Discretion to Use Information. THE COMPANY MAY USE INDIVIDUAL INFORMATION FOR ANY LEGALLY PERMISSIBLE PURPOSE IN COMPANY'S SOLE DISCRETION. The following paragraphs in Section 2 describe how The Movement Academy currently uses Individual Information, but The Movement Academy may change or broaden its use at any time. As noted, The Movement Academy may update this policy from time to time. The Movement Academy may use Individual Information to provide promotional offers to individuals by means of email advertising, telephone marketing, direct mail marketing, SMS text-messaging, online banner advertising, and package stuffers, among other possible uses. By Participating, You Expressly "Opt In" To Receive Information And Grant Us Permission To Share Your Information. If you do not wish to receive marketing offers and promotions via email, direct mail, SMS text and/or telephone we ask that you carefully consider whether to complete the registration process. If you do receive unwanted SMS marketing text messages, you are instructed to reply to the message with “STOP”, “END”, or “QUIT”. You are responsible for all carrier charges that might be incurred as a result of the text message. 2.2 Email. The Movement Academy uses Individual Information to provide promotional offers by email to individuals. The Movement Academy may maintain separate email lists for different purposes. If email recipients wish to end their email subscription from a particular list, they need to follow the instructions at the end of each email message to unsubscribe from the particular list. To unsubscribe from all The Movement Academy’s email lists, a person must send an email to support@onlinetraining1.com. 2.2(a) Content of Email Messages. In certain commercial email messages sent by The Movement Academy, an advertiser's name will appear in the “From:” line but hitting the “Reply” button will cause a reply email to be sent to The Movement Academy. The “Subject:” line of The Movement Academy email messages will usually contain a line provided from the advertiser to The Movement Academy. 2.2(b) Solicited Email. The Movement Academy only sends email to individuals who have agreed on the Website to receive email from The Movement Academy or to individuals who have agreed on Third Party websites to receive email from Third Parties such as The Movement Academy. The Movement Academy does not send unsolicited email messages. As a result, statutes requiring certain formatting for unsolicited email are not applicable to The Movement Academy’s email messages. 2.3 Targeted Advertising. The Movement Academy uses Individual Information to target advertising to an individual. When an individual is using the Internet, The Movement Academy uses Technology Information (see also Section 2.5 below) to associate an individual with that person's Individual Information, and The Movement Academy attempts to show advertising for products and services in which the person has expressed an interest in the Surveys, indicated an interest by means of Technology Information, and otherwise. The Movement Academy may, at its discretion, target advertising by using email, direct mail, telephones, cell phones, and other means of communication to provide promotional offers. 2.4 Use of Technology Information. The Movement Academy uses Technology Information (1) to match a person's Survey Information and Third Party List Information to other categories of Individual Information to make and improve profiles of individuals, (2) to track a person's online browsing habits on the Internet, (3) to determine which areas of The Movement Academy’s web sites are most frequently visited. This information helps The Movement Academy to better understand the online habits of individuals so that The Movement Academy can target advertising and promotions to them. 2.5 Profiles of Individuals. The Movement Academy uses Individual Information to make a profile of an individual. A profile can be created by combining Survey Information and Third Party List Information with other sources of Individual Information such as information obtained from public databases. 2.6 Storage of Individual Information. The Movement Academy stores the Individual Information in a database on The Movement Academy computers. Our computers have security measures (such as a firewall) in place to protect against the loss, misuse, and alteration of the information under The Movement Academy’s control. Notwithstanding such measures, The Movement Academy cannot guarantee that its security measures will prevent The Movement Academy computers from being illegally accessed, and the Individual Information on them stolen or altered. 2.7 Telemarketing. By accepting the terms and conditions of this website, providing your telephone number to participate, you are agreeing to potentially receive telemarketing calls by us or on behalf of our marketing partners or affiliated entities. Notwithstanding that your telephone number may be listed at the Federal Trade Commission Do-Not-Call List, you give us, our partners or affiliated entities the right to contact you via telephone. Our partners or affiliated entities who may be contacting you via telephone currently include Thinking Voice. 3. Dissemination of Individual Information. 3.1 Sale or Transfer to Third Parties. The Movement Academy MAY SELL OR TRANSFER INDIVIDUAL INFORMATION TO THIRD PARTIES FOR ANY LEGALLY PERMISSIBLE PURPOSE IN The Movement Academy’s SOLE DISCRETION. 3.2 Order Fulfillment. The Movement Academy will transfer Individual Information to Third Parties when necessary to provide a product or service that a person orders from such Third Party while using The Movement Academy web sites or when responding to offers provided by The Movement Academy. 3.3 Legal Process. The Movement Academy may disclose Individual Information to respond to subpoenas, court orders, and other legal processes. 3.4 Summary Data. The Movement Academy may sell or transfer non-individualized information, such as summary or aggregated anonymous information about all persons or sub-groups of persons. 3.5 Access. Individuals have access to their Individual Information collected to provide an opportunity for an individual to correct, amend, or delete such information. Access can be obtained by contacting support@onlinetraining1.com. The Movement Academy may also grant advertising clients and email services providers’ access to an individual's email address to verify the origin of the Individual Information collected. 4. Privacy Practices of Third Parties. 4.1 Advertiser cookies and web beacons. Advertising agencies, advertising networks, and other companies (together, “Advertisers”) who place advertisements on the Website and on the Internet generally may use their own cookies, web beacons, and other technology to collect information about individuals. The Movement Academy does not control Advertisers' use of such technology and The Movement Academy has no responsibility for the use of such technology to gather information about individuals. 4.2 Links. The Website and email messages sometimes contain hypertext links to the web sites of Third Parties. The Movement Academy is not responsible for the privacy practices or the content of such other web sites. Linked web sites may contain links to web sites maintained by Third Parties. Such links are provided for your convenience and reference only. The Movement Academy does not operate or control in any respect any information, software, products or services available on such Third Party web sites. The inclusion of a link to a web site does not imply any endorsement of the services or the site, its contents, or its sponsoring or The Movement Academy’s authorization. 4.3 Affiliated Companies. The Movement Academy may disclose, transfer, and sell Individual Information to entities affiliated with The Movement Academy in The Movement Academy’s discretion. Should The Movement Academy be subject to an acquisition, merger, sale or other change of control or business entity status, The Movement Academy reserves the right to transfer or assign the Information collected from the Website. 5. Individuals Outside of the United States. Anyone using the Website outside of the United States acknowledges that personal information will be collected and stored by The Movement Academy in the United States. By using the Website, you consent to the transfer of information to and/or storage of information outside of your country and in the United States. 6. Unsubscribe Procedures. 6.1 If you wish to discontinue receiving email messages from The Movement Academy, you have several options: 1.Unsubscribe from one email list. To unsubscribe from a particular list, either (1) send an email to support@onlinetraining1.com or (2) follow the instructions in each promotional email message sent by The Movement Academy. 2.Unsubscribe from all of The Movement Academy’s email lists. We reserve the right to add Individual Information to multiple lists maintained by The Movement Academy. To globally unsubscribe from all of The Movement Academy’s lists, send an email to support@onlinetraining1.com. For more information about protecting your privacy, you may wish to visit: www.ftc.gov. If you have questions about this policy, please contact us at support@onlinetraining1.com. California User Consumer Rights. In accordance with California Civil Code Sec. 1789.3, California resident users are entitled to know that they may file grievances and complaints with California Department of Consumer Affairs, 400 R Street, STE 1080, Sacramento, CA 95814; or by phone at 916-445-1253 or 800-953-5210; or by email to dca@dca.ca.gov. © 2018 The Movement Academy.com, All rights reserved. At the time of your order, you have the option of accepting our 30-day bonus offer, which includes access to the Private Group and Deep Dive Courses. If you cancel your access prior to the 30th day, you will not be billed anything further. If you do not cancel prior to the 30th day, you will be billed $19.97. Your membership will continue and you will be billed approximately every 30 days until you request to cancel. You have the right to cancel your membership at any time. If you cancel your membership before the end of the 30-day period, you will not be charged further. If you cancel your membership after 30 days, no refund will be issued for the current month and you will continue to have access to your membership for the balance of the current calendar month. You may cancel your membership and any further charges by sending an email to support@onlinetraining1.com or by calling (888) 779-0511. By purchasing this product, (The Movement Academy) you agree to adhere to the termination agreement as outlined above, which is that you, the buyer, are not entitled to a refund of the upfront cost of any products (e.g. The Movement Book) or monthly fees charged due to non-cancellation. Refund Exceptions: The Movement Academy reserves the right to make exceptions to the refund policy, at our discretion, in the form of a full or partial refund. Our Company’s entire liability, and the purchaser's exclusive remedy, shall be a refund of the full or partial price paid, or continuance of access to the Member Resource Center at no additional charge, at our option. By accessing the membership area of this website, which has the same force and affect as signing this agreement by hand, you agree to the following additional terms and conditions regarding your membership with TMA: You have read, understood, and agreed to every provision of this Agreement, including any attachments, exhibits, and amendments thereto. For purposes of this Agreement, the term “Member” refers to the individual that applies for and is accepted into the TMA Membership. By entering into this Agreement, you are becoming a Member of TMA, an online publishing cooperative group and no other relationship is created by joining this membership, including, but not limited to, the following: agency, partnership, employee, joint venture, shareholder, or independent contractor. While your membership provides you with strategies, tips, and ideas for improving your live, you are solely responsible for any action you take based on the content therein. You understand that the information provided is for informational and entertainment purposes only, and any opinions or templates are provided as examples only. You further warrant and represent that all content of your correspondences are created by you and not TMA, and none of the facts, opinions or other substantive content on your communications were provided by TMA. TMA has no ability or duty to control your conduct except for TMA’s ability to enforce this Agreement and its terms. TCM makes no representations or warranties regarding any results from your participating in this membership program. You agree to abide by all applicable rules and laws governing your actions. You represent and warrant that your communications will not contain any materials that are illegal and that your websites are not operated for an illegal purpose or in an illegal manner. You will not slander, smear, defame, or disparage any competitors, company or individual entity, or any words that are meant to mislead a company, customer or consumer. You will ensure that all content you create is true, accurate, and up-to-date. TMA is not responsible for any matter pertaining to your efforts to improve your business profile and you hold TMA harmless from any and all claims, suits, threats, demands, liabilities, actions, causes of action related in any way to your actions and business. Such indemnity includes TMA’s costs and attorneys fees in defending any such matter. You agree and understand that any violation of this Agreement or any individual term and condition herein will result in your immediate removal from the membership program. Either TMA, on the one hand, or you, the Member, on the other may terminated this Agreement at any time, with or without cause, by giving the other party written notice of termination in compliance with the Agreement. You understand that by terminating this Agreement, you will no longer be a Member of TMA. Notices sent hereunder shall be via e-mail to the Member at the e-mail address provided upon the initial registration of your Membership. Any and all notices to the Member via e-mails at such address shall be deemed to be effective notice to you for all purposes. This Agreement shall remain in full force and effect until terminated by TMA or by you, the Member. TMA reserves the right to modify any terms and conditions of this Agreement upon notice to you, the Member. Notice of any changes may be given via e-mail to the Member, or by posting the modifications on the TMA website, or by requiring you, the Member, to click on a button agreeing to a modification during the process of logging in to the TMA website/s (which shall have the same force and effect as a hand signature). Such changes and modifications will take effect upon transmission of an e-mail or clicking on the button indicating agreement. In the event that the Member does not log into the system/s for 5 days after the posting of this modification on the TMA website, the Member will be deemed to have accepted any such modifications. You may terminate your Membership in the event that any of these modifications are unacceptable to you and such termination shall be your sole and exclusive remedy. In the event that you fail to exercise your right to terminate or you continue to remain a Member following such modifications, you will be deemed by your continued participation to accept any and all such changes. This Agreement sets forth the entire agreement and understanding between the parties with respect to the subject matter hereof and supersedes any and all prior discussions, understandings, agreements, representations, warranties, or covenants between the parties related to the subject matter hereof. This Agreement may only be amended by a writing signed by an authorized representative of each of the parties, except as otherwise stated herein. If any provisions or term of this Agreement is held to be invalid for any reason, it shall not affect the enforceability of the remainder of this Agreement or any other terms or condition of this Agreement. Your website and marketing materials must be in compliance with all Federal Trade Commission (“FTC”) regulations in regards to any affiliate marketing or endorsement program you join while a member of TMA. Specifically, to the extent you become an affiliate of any entity and are compensated by that entity, you must include a disclosure on each page of your website and on all marketing material about your relationship with that entity. You must clearly and prominently include this disclosure in writing in a type size and location sufficiently noticeable for an ordinary consumer to read and comprehend it. If you apply the life changing steps from our book ’The Movement’ and are not satisfied with what you’ve learned, your fee will be refunded to you! All you have to do is provide our support staff with the examples of how you needed to improve your life; list the steps from book you applied and the resulting outcome. If your situation was not improved your fee will be refunded immediately. So there is no risk: you have nothing to lose! 'The Movement' by Ryan David was written to teach the tools, strategies and methods to improve the quality of your life and create lasting change, you must adopt new ways of thinking, feeling and acting. You must ask new questions. You must develop a massive action plan, create measurable results and celebrate your joys and victories. Ryan David’s’ personal development books and products can help you learn to unleash the unlimited potential you have within yourself and offer you guidance on your journey to the results in life you want. 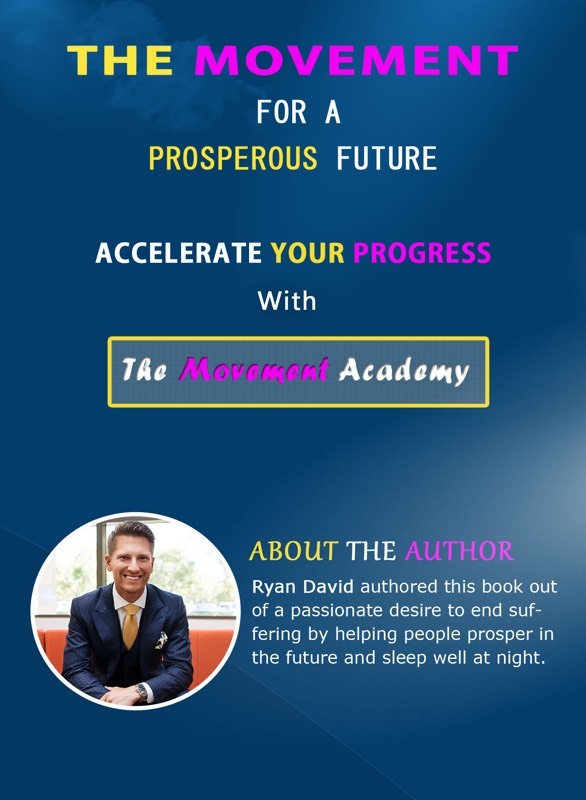 "The Movement Book” For A More Prosperous Future –Ryan has shared simple, easy to follow steps that nearly anyone can apply to improve their lives in todays changing environment. These tips and tricks can be used for almost anything. It’s very important that you know what your problem areas are before you get started on solutions. What do you NEED to change in your life? Do you need it to start a business, spend more time with your children, go back to school, help a family member or friend? Take some time to figure out exactly what you are looking for as you read the book and then you’ll be ready to join the discussion in the private group. Once you've read the book, you'll need to introduce yourself to the group. Often times this step can seem intimidating. Don’t worry; the private group is a ‘No Judgment Zone’. There are typically a few members who have already gone through the steps you’ll need to take to reach your unique goals. In most cases, you'll find examples of this when you search the group database. However, for some, issues may seem to personal and then you'll be able to call or send email for private discussion. Apply the life-changing solutions that you’ve learned and share your successes in the group with a #movement!